I know what Russia looks like. Or at least in two-dimensional form. All I need to do is switch on my computer and images of this vast country will fill my screen. What I want to know, though, is what does Russia smell like? When you walk past a café what scents do you pick up? And, the biggest question for me, what does it taste like? That’s why I adore an author who includes food in her novels. It allows you to research the recipe and have a go at making the dish. It lets you get, through taste and smell, that little bit closer to the characters. So. What does Darya Ivanova’s Russia, from Julie Mayhew’s novel, Mother Tongue, taste like? Darya Pavlovna was eleven when her sister, Nika, was born. Their Mama couldn’t cope so took to her bed. It was Darya who had fed her from the bottle, who had raised her. And she did the best she could. After all, she was still a child herself. Until, one day, on the day of Nika’s Day of Knowledge ceremony, a terrorist attack takes the person Darya loves most in the world. Darya was now eighteen. She’d been the substitute mother of the family for seven years. The terrorists didn’t just take her sister. They took Darya’s identity, her reason for being. And now she needs to discover who she is. Initially Darya responds to the news of her sister with a campaign of ‘domestic terror’. Cooking up a pie, kulebyaka, made with yeast dough and filled with meat, vegetables, rice and egg. Cooking was the way Darya kept herself together. It distracted her. Beef stew, chickens in marinades, bitochki (chicken cutlets) served with cabbage all emerged from her kitchen. And when Darya travelled, to discover just who she was, she continued to cook. After all, that was how she showed her love. Like so many of us who bake and cook. And, when she was missing home what did she do? That’s right. She created food. When I read about the pryaniki in Mother Tongue I knew I had to make them. Spices and honey in a cake? Oh, yes, please. In a saucepan place the instant coffee and add the hot water. Add the butter, sugar and honey and melt over a low heat. Remove from the heat and take a teaspoon of the soda and add the vinegar to it so it bubbles up. Stir into the melted honey mixture. Add the spices and flour. Then beat in the egg. Leave the batter to rest for a while. Or, as Mama says in Mother Tongue, let it rest over night. Place some baking parchment onto a tray and pre-heat the oven to 160 fan. Take teaspoonfuls of the mixture, roll into balls and place onto the tray. Allow spacing in between. Make up the icing by combining the icing sugar with the milk. Place thick spoonfuls over the cooled biscuits. Allow to set. Then serve. 1. The Good Sisters by Helen Phifer - It's 1931 and Mother Superior Agnes has offered safety to a young woman who is running in fear of her life. In the morning she discovers one of the Sisters, in a room locked from the inside, has suffered a terrible fate. Evil has entered the convent. Some eighty years later, Kate Parker buys the run down convent and has dreams of renovating it to transform it into a bed and breakfast. Then strange noises appear at night. Crucifixes start appearing on the walls. And Kate no longer feels like she's alone in the house. 2. Ghostly: A Collection of Ghost Stories by Audrey Niffenegger - the author of The Time Traveler's Wife has pulled together some of her favourite creepiest, weirdest and wittiest ghost stories. The collection includes stories by Edgar Allan Poe, M. R. James, Neil Gaiman, Kelly Link and Audrey Niffenegger herself. 3. Halloween Party by Agatha Christie - a teenager is found dead in a tub of bobbing apples. Joyce had been boasting at the Halloween party that she'd once witnessed a murder. Then she, too, was found murdered. Is Hercule Poirot looking for a murderer, or a double-murderer? 4.The Travelling Bag: And Other Ghostly Stories by Susan Hill - this recently released collection of short stories by Susan Hill, the author of The Woman in Black, promises to leave readers awake long into the night. 5. The Mistletoe Bride & Other Haunting Tales by Kate Mosse - a collection of short stories written by Kate Mosse. This is her first collection. Although some have been published elsewhere before there are eight brand new traditional ghost stories. What books will you be reading this Halloween? Hello, hello, hello! Novelicious is BACK. Ready to share all our book-nerding geekery once more. 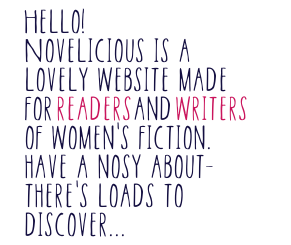 I'm Helen, the new editor of Novelicious. Welcome to my writing room! Come in, take a pew, pick up a few books. I even have cake. Let me tell you all about our plans for the next few months and beyond. It is chock-a-block; the stuff of bookish dreams. For the last few weeks I've been busy working with Kirsty, and we've been planning a calendar of features that we'll share with you over the days and weeks to come. We've got all our usual features: reviews, interviews, writing rooms, writing tips, dates for your diary, alternative Thursday with Debs...and the amazing Julie Cohen will be returning to answer your specific writing queries. We also have new features. Jennifer will be delving into your book clubs to find out what you're reading as a group plus finding out your tips for running a successful one. We are taking a look at the story behind the book. What inspired the author to explore a particular subject or theme in their novel? Anna will be sharing her writing tips. Cress will be looking at cosy books. And once a fortnight I'll be chatting to an author with an interesting story of their own in our Novelicious Weekend Interview. The Novelicious team are, as ever, really excited and raring to go. Kay, Jenny, Kirsty, Susan, Cesca, Verity and Zarina are busy reading and reviewing books at this very moment (probably). We've also got a few new people joining the team. Arpita will be reviewing a classic or modern classic once a month. I'm really looking forward to seeing what she digs out of her incredible book pile. Katy will be focusing on books that transport you to different places around the world. Laura is getting her book-geek on with the bookish products she loves. Rachael is our events woman. She'll be rounding up all those bookish and writing events that are taking place around the country. And Gillian will be looking at the month's new releases. This week alone we have three book reviews and our very first Novelicious Weekend Interview will be coming out on Friday. Perfect to read over the weekend. Publicists, authors, publishers and any other book people do contact me helen@novelicious.com with feature requests or book reviews in the first instance. And if you're on twitter and facebook (we are!) come and tell us what you're reading. What if you were in a dead-end job, with a mean boss and your boyfriend dumps you on Valentine's morning then, then! you found yourself on the receiving end of an inheritance from a relative you'd never met. A rather generous inheritance. This inheritance would enable you to follow your dream. A dream that has been pushed aside for far too long. The only problem is there's a string attached. In order to receive this very sizeable and generous inheritance you'd have to do something you really did not want to do. This happened to Sophie Stone in Conditional Love by Cathy Bramley. For Sophie, the string attached was to meet her father. Just once. But this is a man she has no desire to meet. Will she accept the inheritance and potentially alter the course of her life? The inheritance turns out to be a house in a lovely village. Not only is it situated on the rather gorgeous sounding Lilac Lane, but also has a fabulous neighbour - Octogenarian Audrey. A woman who likes to bake and to feed you. And she likes to feed Sophie orange shortbread! Yep, you guessed it, as soon as I read about it I just had to make some. Heat oven to 170 fan. Place the caster sugar and flour into a bowl and stir together. Rub the butter into the flour and sugar. Add the orange zest. Squeeze it altogether into a dough. Chill in the fridge for half an hour. Remove from fridge, roll out onto a flour surface. Cut out the shapes and place onto a greased baking tray. Place in the oven for 12-15 minutes. Remove from baking tray and place onto a cooling rack. Hurrah! The fourth and last novella is finally out to conclude this gorgeous romance series, based around Primrose Terrace, by Cressida McLaughlin, a colleague of ours here at Novelicious HQ. To say we are proud of her is an understatement. And I have to say I've thoroughly enjoyed it. I really have. First we had Wellies and Westies which was Part 1, then I recreated Waffles with Chocolate Sauce and Sprinkles from Sunshine and Spaniels for Part 2. For Part 3 we had Homemade Doggy Treats from Raincoats and Retrievers (and quite possibly my favourite Feasting column – my dog certainly thinks so!) and now we have Part 4, Tinsel and Terriers. With an essential glass of bubbly. Don't you just love a book that concludes with Christmas? And because it concludes at Christmas there is an abundance of prosecco around to fuel the festivities. In each novella Cressida has described the seasons well, something that is central to the book as Cat is a dog walker – she sees and feels the seasons every time she steps outside her door on Primrose Terrace. As each novella was released during the same season, which I was experiencing in my real life, it really helped to enhance the time of year for me. Tinsel and Terriers starts in October but soon the excitement on the Terrace gets going and we are racing towards Christmas Day. And, as I sat by the fire last night, glass of prosecco in hand, dog at my feet, I began to get rather excited about the big day, too. In Tinsels and Terriers, once more, Cat decides to play a part in the community of the street and get everyone into the Christmas spirit. Will it all work out as she's planned? And which man will she be spending Christmas Day with? If you fancy having a look inside Primrose Terrace and reading about Cat's adventures for yourself, then the novellas are now available as a full length book. The four parts are all together in A Christmas Tail, which is out now. Delicious! Oh my. I think this might be my favourite novel of the entire year. I have only just discovered Ruth Reichl. I know, right? Where have I been? Ruth is a chef, a former restaurant critic, and the last editor-in-chief of the now closed Gourmet magazine to name but a few. She has written some brilliant, mouth-watering memoirs. Tender at the Bone, Comfort Me with Apples and Garlic and Sapphires. I just cannot get enough of her writing. Her writing about food includes such vivid descriptions; taste, smell, as well as how the food looks, with none of this pretentiousness you can get from food writers. They're just sublime. And now she has written a novel. Delicious! is just like her memoirs. Full of food. Full of taste. Full of mouth-watering experiences. And with a mystery to solve. Billie is applying for a job at Delicious! magazine. She has a great ability to detect flavours but just refuses to get into the kitchen (Billie, we find out, has A Past). Except, during her job interview, the editor of the magazine asks her to cook for him. She freezes. But it's a sign of how much she wants the job when she recreates the gingerbread she made with her Aunt Melba some eleven years previously. So, with a white face and panic settling over her body, she makes the cake. "That's awfully nice raspberry cordial, Anne,' she said. 'I didn't know raspberry cordial was so nice." Yes, it's no wonder Anne's friend, Diane, likes the drink so much. She is actually lugging down glass after glass of homemade currant wine. Whoops. Anne of Green Gables cannot help but get herself into scrapes. Whether it be serving her friend alcohol instead of cordial and unintentionally getting her drunk, rigging up her Sunday hat with buttercups or confessing to being responsible for Marilla's lost amethyst brooch, it is no wonder she once commented: "Isn't it nice to think that tomorrow is a new day with no mistakes in it yet?" Anne grew up without her mother and father and was passed around from pillar to post including an orphanage until she settled, accidentally, with brother and sister Marilla and Matthew Cuthbert of Green Gables. Anne, with her bright red hair, has a wonderful view on everything surrounding her. She observes beauty in everything and, if on those occasions she does struggle to find the beauty, she imagines it instead. She chatters constantly but people cannot help warming to her. She is oddly and uniquely wonderful. I'm rather embarrassed to say that I came to Anne of Green Gables as an adult rather than a child. But it is one of those wonderful novels that can be enjoyed by any age group. It's all in the detail, they say. And when it comes to food appearing in fiction I couldn't agree more. Take Wickham Hall (Part 3) by Cathy Bramley. As you know I'm a huge fan of Cathy's writing. And there is a scene within this ebook serial which perfectly encapsulates why. And it's just not a Yorkshire pudding canapé. As Cathy describes: "Each Yorkshire pudding has a wafer-thin curl of roast beef in the centre..." Holly hasn't eaten in ages. They are too much to resist. Yum, she thinks, as she pops one in her mouth. She takes a second one from the waiter before her brain has registered what else is in the canapé. Her eyes start watering. Then follows a beautiful scene of misunderstandings which I won't spoil for you by describing here. All started by a simple Yorkshire pudding. Now I'm with James Martin when it comes to Yorkshire pudding. No faffing, no bits of this or bits of that. Just flour, salt, milk and eggs. This is his recipe. To make canapés you need a bun tin with as many holes as possible. I have a 24 hole bun tin (or mini muffin tin) which is perfect. A few weeks ago my daughter asked if she could deliver my party invitations to the neighbours just like Milly-Molly-Mandy when she goes on errands for her family. This reference to one of my favourite children's books by my six year old daughter made me very happy. The Milly-Molly-Mandy stories are well over 80 years old but they are being enjoyed just as much by this generation of children as they were when they were first published. I can't have been the only one to trace the map, follow where Milly-Molly-Mandy walks to get her sweeties or to Billy Blunt's house. And to see where Milly-Molly-Mandy and Little-Friend-Susan did not go blackberrying. And the Nice White Cottage with the Thatched Roof. If you could dive head first into a story book then this is the one I'd start with. Milly-Molly-Mandy was feeling very disappointed. She was supposed to be going on a visit and staying overnight. The first time she would have been way from home on her own. But at the last minute it was cancelled. She was incredibly dejected. Her mother, or Muvver, as Milly-Molly-Mandy calls her, says: "there are nice things happening all the time, if you keep your eyes open to see them." And how right Mother was. Because not long later Little-Friend-Susan's mother came to ask if they could look after Susan. And mother said yes, and she'd better stay the night. A sleepover? With Little-Friend-Susan! Milly-Molly-Mandy perked up at once. They set up their bedroom, placed their toothbrushes in the right place and decided which side of the bed each one wanted to sleep. Then after a bath together, Mother made them lidded potatoes, which they ate next to the fire. In the earlier part of September this year, Jackie Collins was busy promoting her latest release, The Santangelos. The novel, intriguingly, had the sentence, 'Someone's Going to Die', on the cover. It was shocking that the person who died was Jackie Collins herself. So this Feasting post, is, in my own small way, a tribute to this amazing writer. A writer of bonkbusters, of Hollywood, of gossip behind the shiny veneer. And of books we would secretly read in our teens (or was that just me?). Hollywood Wives sold over 15 million copies and was one of Jackie's most successful novels. It has a huge cast of characters including: Elaine and Ross Conti, Buddy Hudson and Angel Hudson, and Sadie LaSalle. Something links these characters...but what is it? Or, who is it? Angel intrigues me. She is so sweet, so innocent and naive. The complete opposite to the other more ruthless characters in the novel. She was, thought Buddy, "Christmas six months early". She was beautiful on the inside and on the out. A rare combination in Jackie Collins' Hollywood. After they'd met and had a whirlwind romance in Hawaii, culminating in their wedding, the two lovebirds made their way back to Hollywood. Buddy was determined to make it as an actor. And Angel happily looked after him. He was, after all, the family she'd never had. The family she'd yearned for. And, on this particular day she fixed him, for dinner: "Hamburgers, green beans, baked potatoes and apple pie." Yum. Could you not just eat that too? Apples are in abundance at the moment. For my pie I just peel and cored enough apples to deeply fill my dish, scattered over sugar, then used this slightly sweetened version of this easy rough-puff pastry recipe by Gordon Ramsey to make a pie crust. Okay, so you're just going to have go with me for this week's Feasting on Romantic Comedy column. Go on, indulge me. I've brought you, over the last two years, all sorts of foodie delights from the realms of fiction. But now it's time I provided a recipe inspired by our beloved fiction to treat someone rather special in our lives. Cressida McLaughlin's series of ebooks based around Cat, a dog walker on Primrose Terrace, is proving extremely popular. We're now on the third installment, Raincoats and Retrievers, and romance for Cat is hotting up. Cat lives with with her friend Polly and Polly's brother Joe in Primrose Terrace. Cat has previously helped out neighbour Frankie in Sunshine and Spaniels (part two of the series) and managed to turn a negative into a positive in Wellies and Westies (part one of the series). In Raincoats and Retrievers Cat cannot resist in getting involved in her neighbours' lives. That is what she does after all. And this time it's the couple with the retrievers. It's perhaps not the wisest move on Cat's part. But lets, for a minute or two, celebrate the stars of this gorgeous series. (Incidentally the complete series is available in paperback in early November.) Each dog in this series has a lovable personality. You cannot fail to adore them. However, not everyone feels the same way about dogs as Cat is soon to find out. Cat is always carrying doggy treats around with her so I thought I'd investigate some homemade versions. After all, you can't beat a homemade version of a cake, so I'm sure the pooches would prefer a homemade version of a doggy treat. Wouldn't they? As you can see from the photograph, my dog thoroughly approves. The treats I made were from Sally's Baking Addiction except I included some leftover cubed meat from the Sunday roast. Five Go Glamping is the debut novel by Liz Tipping. It features four people, Fiona, Steph, Sinead and Kirk as well as Brian Harvey the dog. Making five. Obviously the title and the (four human and one dog) characters make you think of The Famous Five by Enid Blyton. But, not only that, the characters all love ginger beer. It just so happens that the ginger beer in question is of the alcoholic variety. Fiona, the main character, is obsessed by her five year plan. She works in a job she hates, including overtime on a Saturday, just because she and her boyfriend, Connor, are saving up for a house of their own. Her best friends are Steph and Sinead. After a bit of a 'situation' at work they all decide to go on a free trip offered to them – staying in a yurt at a festival in the west country. Thus, this five go off on an adventure of their own. Excited by the prospect of a (free) holiday they stock up on alcoholic ginger beer and set off. They stop at a pub, close to the festival, when the car breaks down and are helped by a man who seems to connect with Fiona. When they finally get to their destination it's all a bit hippyish for their taste. Well, to Fiona, Kirk and Steph's at least. Sinead throws herself into it. And Fiona seems to end up dog-sitting Brian Harvey quite a lot. There's only one thing for it. Ginger beer. Fiona goes on dog walks and finds herself in a few scrapes, only to come across that same man from the pub ... her adventure is about to begin. You can always make yourself some non-alcoholic ginger beer, too. Jamie Oliver has the perfect recipe. The Great Village Show by Alexandra Brown is the second in the series about fictional village, Tindledale. The first, The Great Christmas Knit Off, was, obviously, a Christmassy novel – containing a delicious Panettone Bread & Butter Pudding and focussing on Sybil and the haberdashery shop in the village. It is now summer, and we have Meg's story. Meg is the headteacher of the village school. Her son, Jack, has just left home for university, leaving a bit of a hole in Meg's life. So she decides to throw herself into village life, and, in particular, The Great Village Show. If she can make the show a success she could get much needed publicity for the village. This would encourage more people to move there and more children would be enrolled in her school, which, sadly, is threatened with closure. One sunny Saturday morning, Meg is up and about, raring to go. She strolls around the village sorting out plans for the village show and chatting to people. Then she makes her way to Kitty's tearoom, called The Spotted Pig (which, incidentally, is where Sybil sees the sign for the panettone pudding) and treats herself to a sandwich with locally sourced cheese and homemade chutney, along with a huffkin bun and a hot chocolate with the works. Seriously, my mouth is watering as I write that sentence. You had me at 'locally sourced cheese' if I'm honest. One of the (many) things I love about Cathy Bramley's books is that she adds so much food to her novels. In Appleby Farm it could be a cottage pie, a 'sweet dreams special' (real butter on toasted homemade bread and hot milk with a sprinkling of nutmeg and sugar) or just a simple plate of buttery scrambled eggs. Each dish immediately adds depth to the story. You can picture yourself getting a hug from Freya's aunt (smelling of Nivea face cream and homemade bread) in the warm farmhouse kitchen, eating the food and gaining the same pleasure from it that Freya is experiencing. I read Appleby Farm when it came out in a four-part ebook serial. I'm actually becoming a fan of that format, but I've also treated myself to it in paperback. Why? Because I love the story. Freya is working at the cafe near Ivy Lane's allotments when she receives a phone call that changes everything. Her aunt and uncle in the Lake District need her. They were the ones who raised Freya as a child whilst her parents were working abroad, so now it is Freya's turn to help them. Freya makes her way to the farm and finds out that, not only has her uncle had an accident, but they are in financial difficulties. Can Freya help them out? And, is there time for a little romance too?